Sorry, but Ethiopia Amaro Gayo Organic has sold out. We plan offer the next crop which is due to arrive shortly. Arrived August 2013, new crop and we are happy to have it back after a long absence. Amaro Gayo Organic, a wonderful natural coffee, is exported by Asnakech Thomas, Ethiopia's only female miller and exporter, and reputed to be an exceptional, energetic and inspiring woman. Native to the Amaro region, Asnakech decided in 2005 to return to her homeland to improve coffee quality at her mill and in local communities. She is one of the few people to travel weekly between Addis and the coffee areas. The Amaro Mountains are a small range separating the communities of Amaro on the eastern slopes from Nechisar National Park and the lowland tribal areas of Arba Minch in southwest Ethiopia, Sidamo region. The local coffee varieties, relatively light population, waterfalls and highland bamboo forests are among the many unique features of the area. Asnakech has become a big success story and her mill operations have been steadily growing. Amaro Gayo is a washing station where local growers bring their freshly picked, ripe cherry for processing. Asnakech is said to be very strict in selecting which coffees will be processed at her washing station and mill, choosing only ripe and ready cherry. The final step in natural processing, drying, is critically important one. At Amaro drying is carried out on raised African beds, keeping the coffee clean and free of soil, while aerating it from top and bottom. 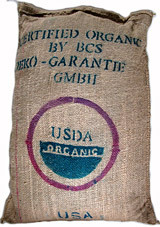 All Amaro Gayo coffee is USDA certified organic. Prices paid for this coffee are at the extreme high end of market, social programs are in the works including possibilities for assistance with capacity building and coffee job creation, schools, clean water and medical care. Asnakech is a client of Fintrac�s USAID-funded Agribusiness and Trade Expansion Activity (ATEA), which improves specialty coffee production and quality in Ethiopia. In 2007 Fintrac helped Asnakech install a coffee processing machine and showed her how to run the eco-friendly pulper. The project also deployed agronomists and consultants to her mill to advise her on how to create specialty coffee at every step of coffee processing -- from looking after trees, to picking, to drying cherries. Fintrac gave Asnakech and producers like her an opportunity to reach new markets and showcase their specialty coffee. She is a perfectionist and go-getter so, in addition to this fine coffee, look for more and better coffee coming from her in the near future. We were not able to acquire any of this fine coffee in 2011. We had samples a washed version but it was not up to expectations. However, 2012 has brought us the natural Amaro is best known for. It's a terrific natural at a reasonable price. 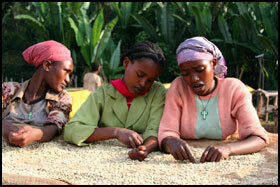 Women sort coffee beans at a processing facility in Ethiopia. Cup Characteristics: Lush, blackberry and blueberry fruit flavors, powerful. Agressive and complex acidity, with notes of both dry, red wine and lemons. Layers of puckery, citrus fruits, mostly grapefruit. Thick body, chocolate mouthfeel. Roasting Notes: Keep the roast approaching second crack but definitely not beyond if you want to capture all that this coffee has to offer. City to City+. There is a small percentage of small or broken beans, about half dozen per quarter pound.